Politicians come and go but the Queen has been around since I was born. She was in my mother's purse and now she's in mine. She's been a constant through changes in my life. A link between my past and my present. I can't ignore the Queen. She keeps appearing as I unpack boxes from the past. "Now THIS you must treasure!" said my late mother. "It's an original newspaper of the Queen's coronation. Keep it in the dark, wrapped carefully. You can see it's starting to disintegrate." For many years the Queen's been lying in the dark but today she'll see the light. How beautiful she looks, how radiant as she walks down the aisle in Westminster Abbey. Winston Churchill is quoted in this edition of 2 June 1953. "Let it not be thought that the age of chivalry belongs to the past. Here, at the summit of our world-wide community, is the lady whom we respect, because she is our Queen, and whom we love because she is herself. Gracious and noble are words familiar to us all...tonight they have a new ring in them, because we know they are true about the gleaming figure whom Providence has brought to us in times when the present is hard and the future veiled. "It is our dearest hope that the Queen shall be happy, and our resolve unswerving that her reign will be as glorious as her devoted subjects can help to make it. We pray to have rulers who serve, to have nations who comfort each other and have peoples who thrive and prosper free from fear. May God grant us these blessings." I fold the yellowed, torn and crumbling paper. Now to the bag of old coins. The Queen looks at me. Long, slim neck. Serene and elegant. 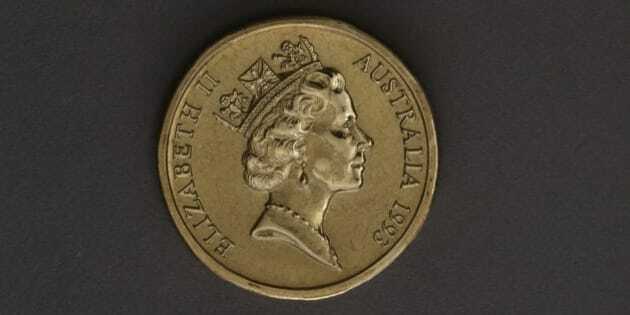 She disappeared from South African coins in about 1963 when we became a republic. I'm now in Australia and the Queen's back in my life. Her jaw line and neckline have thickened since I last saw her, but she's still smiling. On Australia Day 2015 they whispered about becoming a republic. Australians were asked for comment. "Oh no, you're not changing my flag! I've grown to like the pattern...don't go and take Britain out of it!" said a middle aged woman. "We will consider the issue of becoming a republic once the Queen dies or abdicates," said someone in authority. Politicians come and go but the Queen has been around since I was born. She was in my mother's purse and now she's in mine. She's been a constant through changes in my life. A link between my past and my present. She has been like a well loved granny whom I didn't see often but always knew was there. Photos of her in matching hats, gloves and handbags. Hard working. Smiling. And even though she's shrinking (just like my late mother at that age although the weight of the crown could have contributed) she's still courageous and filled with hope. I was moved by her Christmas 2014 speech. Apparently, it was the most watched broadcast in the UK at that time. "...For me, the life of Jesus Christ, the Prince of Peace, whose birth we celebrate today, is an inspiration and an anchor in my life. A role model of reconciliation and forgiveness, he stretched out his hands in love, acceptance and healing. Christ's example has taught me to seek to respect and value all people of whatever faith or none." I'll pack her away carefully now, wrapped in cloth. The coins in the cabinet will remind me that we were all young once, even the Queen. The young Queen on my South African coins next to her older self of 2013, on the Australian coin celebrating the 60th anniversary of her coronation. The question of the Queen remains. Some argue politics. Others like patterns. I'm for the person. I like the twinkle in her 89 year old eyes. Long live the Queen...from the depths of my purse to the heights of the Australian flag.